Depression is a serious condition and should be treated/diagnosed by a qualified health care professional. If you are struggling with mild depression, particularly seasonal affective disorder (SAD), look to your diet. Did you know that nutritional deficiencies can increase your vulnerability to mood changes and mild to moderate depression? Certain nutrients, such as carbohydrates, vitamins and minerals, found in healthy foods, can alter your brain chemistry, which plays a large role in your overall mental health. In addition to complex carbohydrates, certain B-vitamins, iron and omega-3 essential fatty acids are all important nutrients in your quest to help alleviate mild depressive symptoms. Complex carbohydrates –pasta, potatoes, whole-wheat bread, cereal and brown rice contain tryptophan, an amino acid that converts to serotonin in the brain, a chemical that helps regulate mood, appetite and sleep. Elevated levels of serotonin in the brain are associated with happiness and a positive mood, not depression. Try starchy, root vegetables as well such as turnips, sweet potatoes, rutabagas, corn and squash. Iron- iron deficiency symptoms are not unlike those of mild depression: an inability to concentrate, feeling sluggish/irritable and fatigue. Make sure you consume foods rich in this important trace mineral. Good food sources include lean meat, fortified cereals, prunes and other dried fruits, seafood and dark green veggies. B-vitamins- Folate (vitamin B9) and vitamin B6 are essential for producing a class of brain chemical messengers that influence behavior, one of which is serotonin. Eat plenty of vitamin B6-rich foods, such as fish, poultry, bananas, nuts, potatoes and whole grains. Folate deficiency can contribute to depression. Think ‘greens and beans,’ and concentrate on fortified cereals, broccoli and spinach and orange juice for folate. Keep in mind that cooking destroys folate. 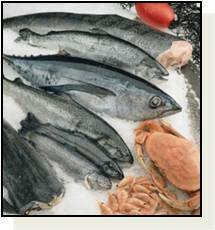 Omega-3 fats- those that consume oily fish, such as tuna and salmon, regularly have particularly low rates of depression. All seafood contains some omega-3 fats, a class of polyunsaturated fats necessary for the health of both the cardiovascular and nervous systems. Omega-3 fatty acids in fish also trigger the production of serotonin. Non-seafood sources of omega-3 fats include walnuts, flaxseeds and canola oil.